With growing tensions between countries, it’s hard to come across a story that brightens our day but that doesn’t mean that good things don’t happen all around us. Every day, there are good samaritans around the globe who perform some heartwarming acts. While most people carry out acts of kindness without letting others know, some moments were captured to last an eternity, thanks to smartphones. Here, we are listing some amazing stories of those whose actions are sure to put a smile on your face. 1. A kind hearted gentleman saw that a homeless man was in need of clothes. So, he took time to open his bag and gave him a few pair of clothes before going his own way. The above image was captured in LA’s Union Station a few years back. The unidentified man saw that a homeless man was in dire need of clothes. 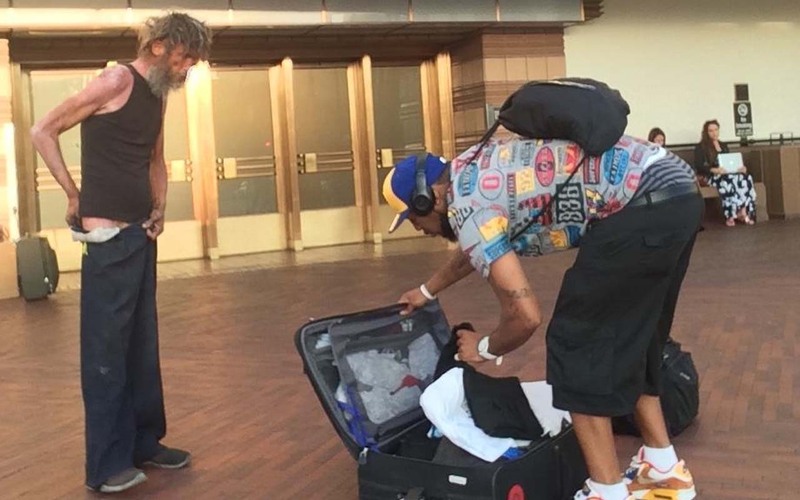 So, he stopped, opened his suitcase, took out some clothes and handed them over to the homeless man. It is believed that the homeless man suffers from bipolar disorder and schizophrenia, but does not have any money to get help. The homeless man’s situation is a gentle reminder of how unfair life can be, but the image itself shows that the only way we can survive in this planet is to help each other. 2. Every Valentine’s Day, this amazing gentleman takes widows from the nursing/retirement homes nearby and treats them to lunch, gifts and a rose for each. He has been doing this for the last 5 years. Old folks are often forgotten in nursing homes. 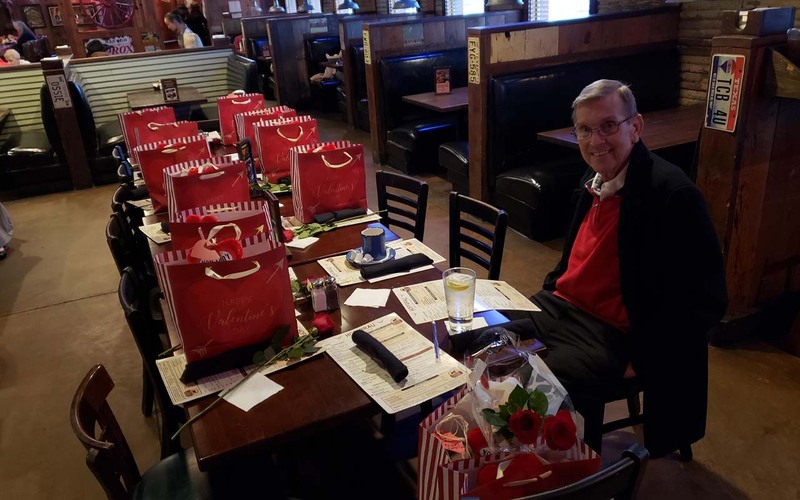 In order to spread some love and smiles, this amazing man takes widows from nearby nursing homes out to lunch on Valentine’s Day. His kind act goes a long way since it helps many that are battling depression and the loss of their loved ones. The US National Library of Medicine reports that depression is very common among people above 65 years living in long-term care. Such acts surely make a huge impact on their health and well-being. 3. Every day, an Iranian teacher visits one of his students who is battling cancer and proceeds to teach him things he has missed that day at class. Teachers are some of the most hardworking people on Earth but they often don’t receive the praise they deserve. 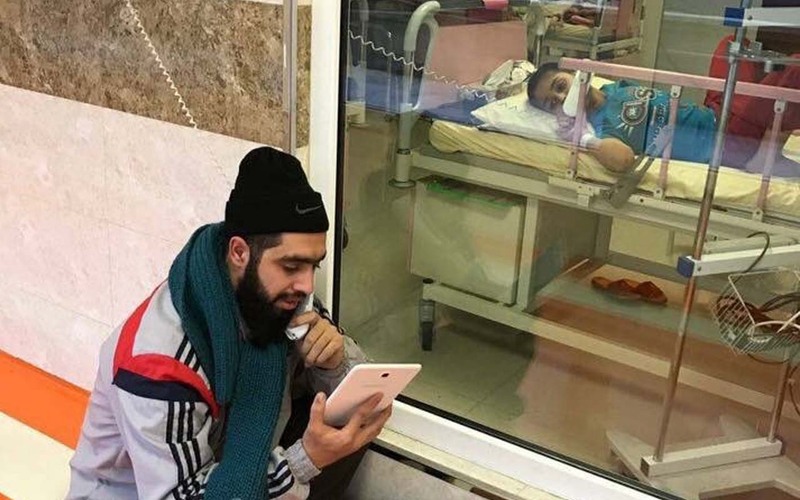 The image of an Iranian teacher visiting the hospital and helping a cancer-stricken student catch up on class, shows how amazing these men and women are. With the help of an intercom and a tablet, the teacher makes every day visits so that he can catch-up on his school work. This act of kindness shows the importance of education. Many internet users believe that the teacher should receive a medal for his determination to never give up on a student, even at desperate times. 4. When a frail old man was struggling to cross a busy road in China, a police officer saw him and decided to help by carrying the old man on his back. A Chinese police officer managed to win the hearts of millions around the world after he was caught on CCTV helping an old frail man cross the street. On June 4, 2018, the retiree was crossing the street when the lights changed. Although oncoming traffic waited for him to cross safely, officer Qin Weijie saw him and decided to help. The on-duty police officer offered his back and carried the man across a six-lane road. After carrying him to the other side of the pedestrian crossing safely, Qin returned to help others in need. The video made rounds around the world and many appreciated the officer’s kind heart as well as the drivers who patiently waited for them to cross the street. 5. 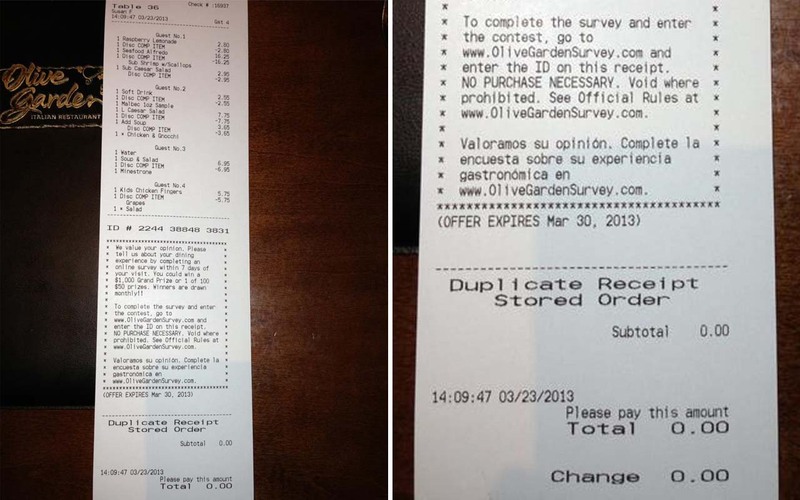 When a family went out to eat at Olive Garden, the manager asked how they were doing. One of the family members revealed that their family house had just burned down. This was the bill they received at the end of the meal. When Seth McClure, his brother, wife and 3-year-old daughter went to eat at Olive Garden, the manager asked them how they were doing that day. McClure’s daughter responded by informing him that their grandfather’s house had just burned down and how sad they were. In order to surprise them and help to lift their spirits, the manager provided them with a free meal. 6. 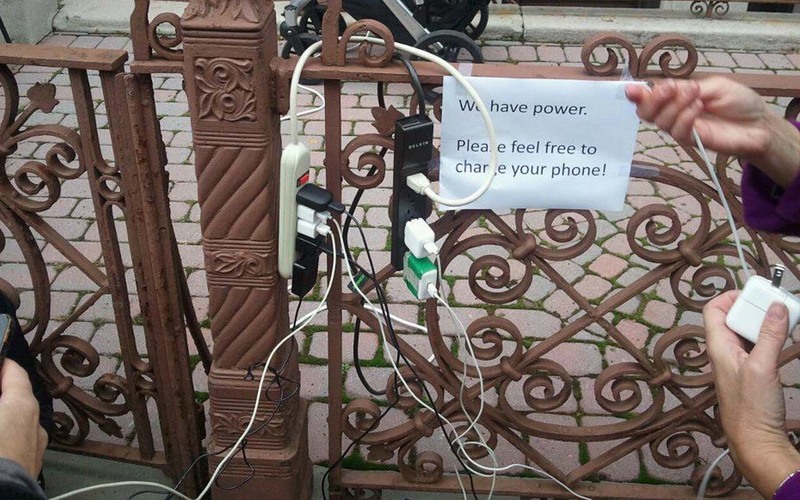 After hurricane Sandy caused major power outages across Hoboken, NJ, a family who had a generator, decided to share their resource with those who needed it so they could connect with their loved ones. In 2012, hurricane Sandy caused a great amount of destruction, but it also brought out the best of humanity. Many people came forward with acts of kindness, whether it be providing food or blankets or something as simple as keeping people informed of current events. One such act of kindness came from a family that had a generator. Instead of keeping it hidden from the world, they decided to help others by sharing their resource with others who needed it. 7. 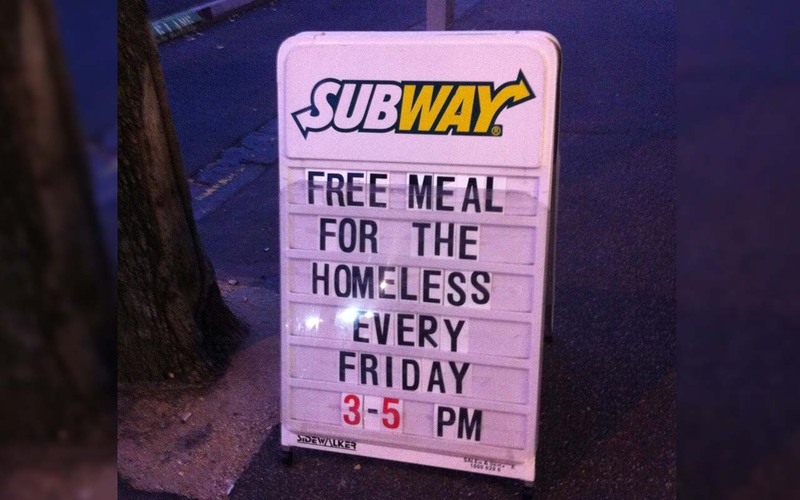 The owner of a Subway in Melbourne, Australia, gives out free sandwiches to the homeless every Friday. According to the Food and Agriculture Organization, roughly one third of the food produced in the world for human consumption every year goes to waste. In industrialized countries, the wasted foods can cost as much as $680 billion. While most individually owned businesses do not care about feeding others for free, the owner of a Subway franchise in Melbourne is making a change by providing free meals for the homeless, once a week. While this doesn’t completely solve the issue, it is definitely a great start. 8. 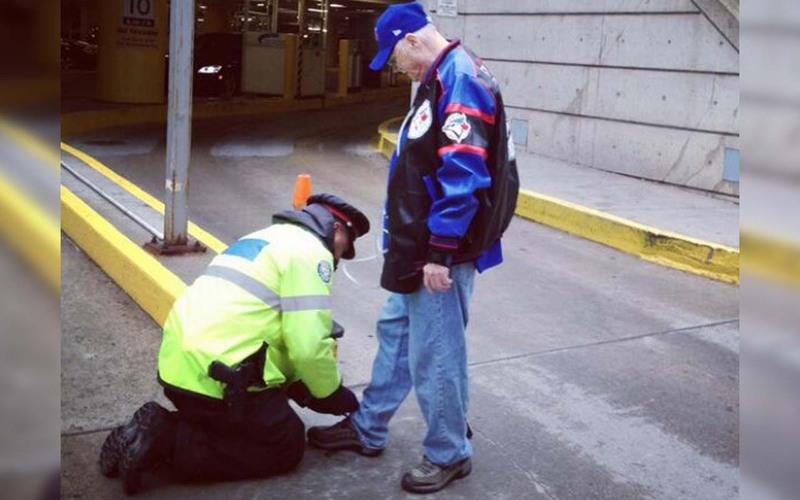 A police officer in Toronto helping an old man tie his shoelaces. In 2013, Mark Borsboom, a Toronto police officer, was on duty when he witnessed an elderly man walking with a cane with his shoelaces untied. Not wanting him to trip and fall, the officer offered to help tie them. The old frail man accepted the offer and allowed the officer to help. Jason Cassidy was walking past the two when he witnessed the random act of kindness and he decided to capture the moment. 9. A Walmart employee sat down on the floor so that a customer who was dizzy, could lean on him until help arrived. 10. 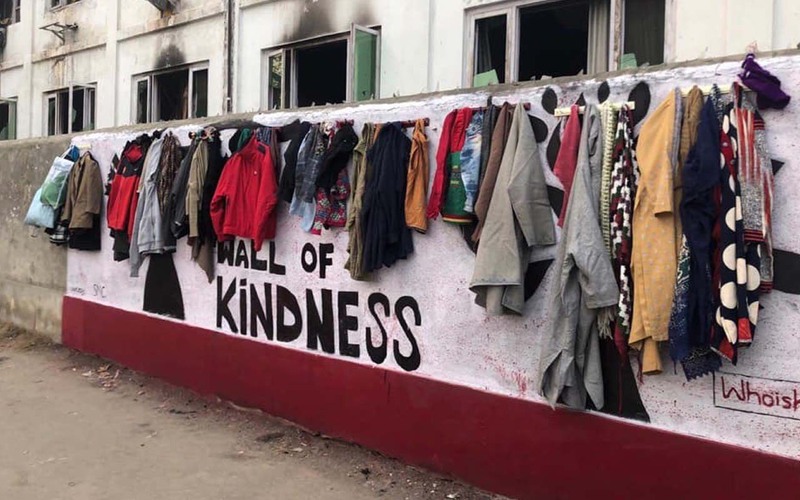 This is the “Wall of kindness” in Srinagar, India, that provides warm clothing for those who are not able to afford them. During the coldest months, Srinagar sees temperatures fall below zero. While most people depend on tourism to survive, not everyone makes big bucks. For some, staying warm is harder than keeping food on the table. That is why a local group has started an initiative that provides warm clothes for those who are not capable of affording them. This way, they can focus on their work and families instead of spending money on clothing. In order to see change, we have to be the change within. These random acts of kindness shows us that there are good things happening around the world. They also restore our faith in humanity. Previous 10 Random Facts That Are Guaranteed To Make You Say “Whoa”!